The Commerce Department said factory orders fell in February for the fourth time in five months. Excluding volatile orders for transportation equipment, orders rose for the first time in four months. Longer-lasting durable goods orders declined 1.6% while requests for non-durable goods rose 0.6%. Year-to-year, factory orders rose 2.4%, slightly behind the rate at which business investments were growing. 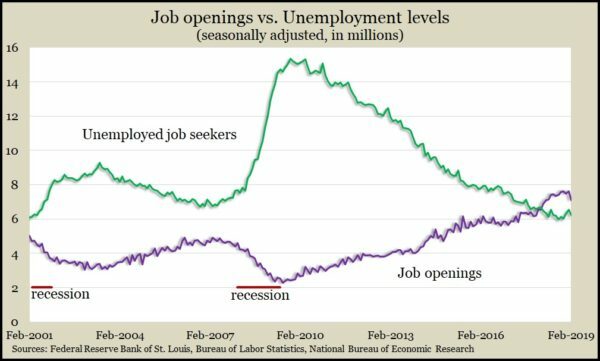 U.S. employers reported 7.1 million job openings in February, up more than 7% from January, which was second highest only to November in 18 years of data from the Bureau of Labor Statistics. 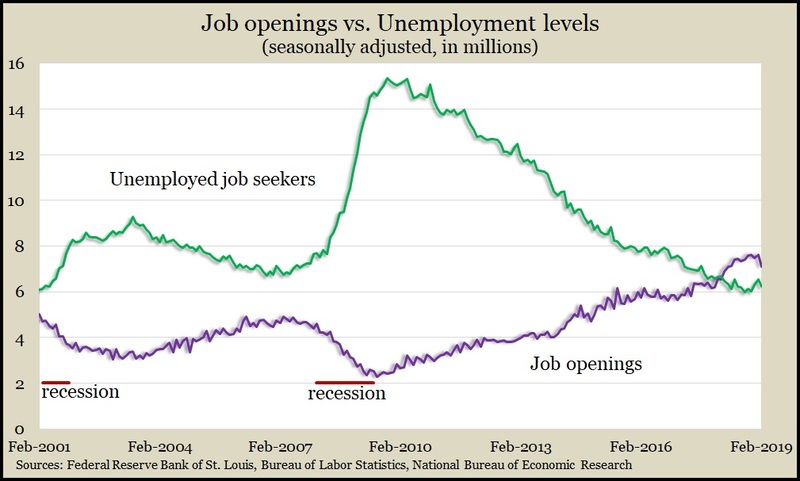 For the 12th month in a row, open jobs outnumbered the number of Americans who were out of work and looking for positions. The level of hiring stayed at an historically high level. The quits rate, which indicates worker confidence in finding a new job, remained at an historically strong 2.3% for the ninth month in a row. The broadest measure of inflation, the Consumer Price Index, rose 0.4% in March, with 60% of the increase powered by a 3.5% gain in energy prices. Excluding energy and food prices, the core CPI grew 0.1%, the same as in February. Year-to-year, the core rose 2%, the smallest gain in 13 months, according to the Bureau of Labor Statistics. Higher costs for shelter and food away from home contributed to the rise in annual inflation. The four-week moving average for initial unemployment claims sank to its lowest level since late 1969. Data from the Labor Department show new jobless applications are 41% below the 52-year average after falling for the sixth time in seven weeks. Claims have been below average every week since the beginning of 2013, underscoring a tight labor market, which should empower consumers to spend more. Consumer spending accounts for about two-thirds of the U.S. economy. Mostly because of the increased costs of energy, wholesale inflation rose in March at the highest monthly pace since October. Including volatile prices for food, energy and trade services, the Producer Price Index rose 0.6% from February and 2.2% from March 2018, the Bureau of Labor Statistics reported. Excluding those prices, the core rate of wholesale inflation was unchanged. Year-to-year, the core rate rose 2%, having dropped every month since hitting 3% in October. The University of Michigan said its preliminary consumer sentiment reading for April declined – but only in the expectations component. Feelings toward current conditions rose slightly. An economist with the survey said consumer sentiment has been in a “sideways shuffle” recently but over the past 30 months has been at the highest level since the last 10-year economic expansion, which ended in 2001.